Use the 25ft. Stainless Steel Under Carpet Fish Tape for easily running low voltage wiring between a carpet and pad. 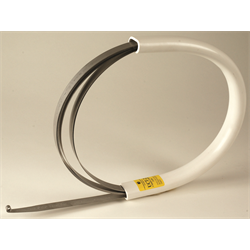 Constructed of a high grade stainless steel, 3/4” x 25ft, it has a curl on the leading end to provide a non-snag tip to tunnel under carpet to your destination. Even works over waffle type padding. There are attachment points at both ends for wiring or pull cord. Comes in a durable plastic storage case.